Space scientists around the world are celebrating ten years of groundbreaking discoveries by 'Cluster', a mission that is illuminating the mysteries of the magnetosphere, the northern lights and the solar wind. Cluster is a European Space Agency mission, launched in summer 2000. It consists of a unique constellation of four spacecraft flying in formation around the Earth, studying the interaction between the solar wind and the magnetosphere. The spacecraft each carry an identical set of 11 scientific instruments, which together capture 3D information about the magnetosphere - the Earth's 'magnetic shield'. A key instrument - PEACE - was designed by a team led by space scientists at UCL. The solar wind is a continuous outflow of hot, magnetised, electrified gas from the Sun. The Earth is shielded from the solar wind by its magnetic field, which surrounds the planet in a zone called the magnetosphere, many times larger than the Earth. The magnetosphere prevents the solar wind from stripping away the atmosphere and protects Earth from deadly energetic particles produced by storms on the Sun. However the magnetosphere is not a perfect shield. Energy and material from solar wind can get inside, to cause the northern lights, ionospheric disturbances, the generation of radiation belts and disturbances to the ground-level magnetic field. These 'space weather effects' are important because they interfere with spacecraft operations, communications, GPS signals and electrical power systems on the ground. Cluster is being used to find out how transfer of solar wind energy to the magnetosphere leads to these diverse effects. PEACE measures electrons and electric currents in the solar wind, magnetosphere and aurora. During Cluster's mission PEACE has been used to study huge bubbles of plasma three times the size of Earth jetting through the magnetosphere, very thin sheets of electric current flowing through space where explosive magnetic reconnection occurs, and grand waves on the edge of the magnetosphere, formed by the solar wind 'blowing' over the surface before breaking and forming tornado-like vortices. Dr Andrew Fazakerley, from UCL's Mullard Space Science Laboratory, and Principal Investigator for PEACE, said: "Cluster is revolutionising the study of the solar wind and the magnetosphere because it is the first space mission to reveal what plasmas are like in 3D, which is crucial to testing our theoretical models." Cluster is also the first multi-spacecraft mission to study the northern lights or aurora. The aurora are caused when electrons from the magnetosphere smash into the upper atmosphere, but it's a mystery how these electrons are accelerated to high enough energies. Cluster's simultaneous measurements at different locations have given scientists the first opportunity to test ideas about what could be the cause. "Cluster was not designed to visit the aurora, but luckily the orbit of the four spacecraft has naturally evolved to allow us to explore the unexplained auroral acceleration region which is the key to the formation of the aurora," said Dr Forsyth. "We are very excited at the coming opportunity to investigate how the magnetosphere responds in the near future, as solar activity increases to solar maximum," said Dr Fazakerley. 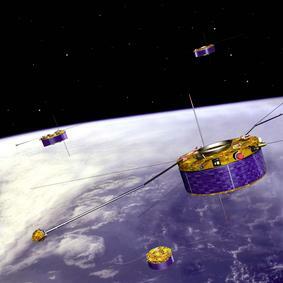 Image caption: An artist's impression of the four Cluster spacecraft orbiting the Earth, flying in formation at the same distances from one another. 1. The Cluster mission was first proposed in 1982. The original quartet of spacecraft was destroyed in rocket failure during launch in 1996. The replacement spacecraft were launched in pairs, in July and August 2000, being brought together in their operational orbit on 01 September 2000. The initial orbit was a polar orbit with apogee ~20 Re and perigee ~ 4 Re, where Re = Earth Radius, 6370 km. 2. The distance between the spacecraft is carefully varied from year to year to enable study of both vast (10,000 km scale) and tiny (10's km scale) phenomena. The spacecraft configuration is sometime an equal-sided tetrahedron, at other times a triangle aligned along the magnetosphere's boundary surface, with the fourth spacecraft close to the third to measure across the thin boundary surface. 3. The China-ESA Double Star mission launched in 2004 used 2 more spacecraft, carrying spare Cluster instruments and Chinese instruments. Double Star spacecraft were placed in orbits that complemented the Cluster orbits, enhancing the scientific power of both missions. 4. Magnetic reconnection is a process that occurs throughout the universe in which energy stored in magnetic fields is converted to kinetic energy of plasmas. It is the key to understanding solar flares, and also how solar wind energy and material can get into the magnetosphere. The Earth's magnetosphere is the best place for plasma scientists to study reconnection and to improve our understanding of how, why and when it happens - Cluster has made strong contributions in this area.